"On the road is where I really come alive." Netflix has released an official US trailer for Ricky Gervais' new film David Brent: Life of the Road, which is finally being prepped for release in February on Netflix. 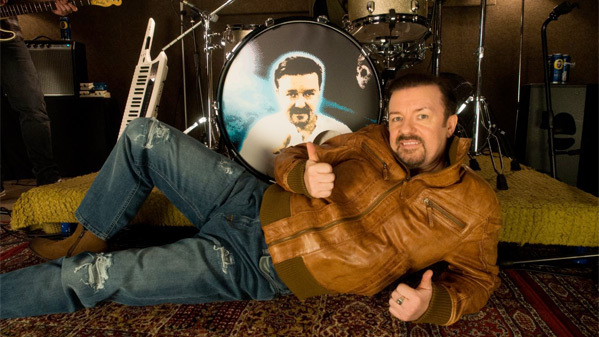 The film follows Gervais' character from "The Office" series, David Brent, who has now turned to the life of being a rockstar in a band called "Foregone Conclusion". Hilarity ensues. The cast includes Tom Bennett, Jo Hartley, Mandeep Dhillon and Rebecca Gethings. We've previously featured a few different UK trailers for this, but if you are still curious, here's another one made for the upcoming US release. This is probably only for die-hard fans of Gervais or "The Office", but check it out below. Not many laughs from me. A camera crew catches up with David Brent, the former star of the fictional British series, "The Office" as he now fancies himself a rockstar on the road. Directed, written by and starring Ricky Gervais, David Brent: Life on the Road is a feature length film which sees a documentary crew catching up with David Brent twelve years on from the mockumentary "The Office". Brent is now a travelling salesman, chasing his dream of rock stardom by self-financing a UK tour with his band, "Foregone Conclusion". The film is written & directed by Ricky Gervais, who has previously directed the films Cemetery Junction and The Invention of Lying, not to mention lots of TV directing work. Life on the Road opened in UK theaters last August, but is just now arriving in the US. Netflix will debut on February 10th. For more info, visit Facebook. Anyone? David Brent shows how brutal normal life is. The Office stuff was so cringe inducing I often couldn't watch it. It is funny too. Sad, really. // Gervais's other comedies are killer though.